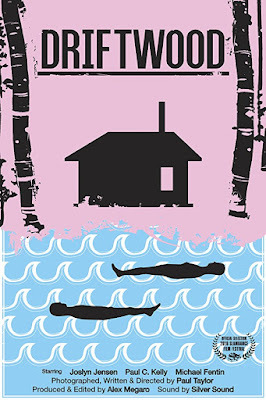 Winner of the Jury Prize at Slamdance, Paul Taylor's DRIFTWOOD is a one of a kind film. A largely wordless two hander the film charts the course of a relationship between a man and a woman who appears on the shore near his home. Allegorical film about interpersonal relationships especially those of the male female patriarchal variety DRIFTWOOD is going to delight some and vex and annoy just as many. Its is a film that left one either falls madly in love with or shuts off and moves on to the next thing. And as I say that I can hear the filmmakers, the PR people and the iTunes folks pulling their hair out of their heads. They may not like my saying that but it is the truth, you're either going to love the film or hate it. After seeing the film and slightly uncertain of what I had just seen I went on line to see what other people had said about the film. The desire to engage in some sort of a discussion on the film was the result of needing to try and find a way to describe what I had just seen. The material from the filmmakers was intentionally sparse, so we are open to viewing events as we choose. In reading on the film I found that what it all means was open to interpretation. Personally I'm not sure what I think of the film. I think it's a film with a great deal on it's mind but I'm still trying to sort out if it means anything. I know many people I respect have loved the film and have found great meaning in the film, but at the same time I'm not sure it's there. Details are sparse from the get go where we see a shadowy form walking, see the girls face and then find her laying in the back seat of a car before we see her being put to bed. We then watch as the man serves her a meal and she is confused by the prayer. We are left to fill in all the details- which explains why the film's press material is so sparse. It's in the details where the divide in the audience is going to come. Those who want real answers and spoon fed meaning are going to be bothered by the film's intentionally obtuse nature. They are not going to work with the film to try and divine their own meaning the film will be totally lost to them. On the other hand if you want a film that you have to engage with and wrestle with to make your own then you are going to love it. I'm not sure where I stand on the film. I'm intrigued by it. I'm annoyed by it. I know it's trying to articulate something that is on its mind but I'm not sure it succeeds. Then again, as I said above, several people I know and respect have loved the film and have been moved by it. Is it worth seeing? If you want something that is not Hollywood, not on the typical inde track yes absolutely. This is a film for anyone who wants to engage with their stories head on and wrestle them to the ground. Its a film that is not going to make you instantly feel like moving on to the next thing, it is film you'll want to ponder. Basically it's the sort of a film that Unseen Films was set up to highlight. DRIFTWOOD is currently available exclusively on ITunes.